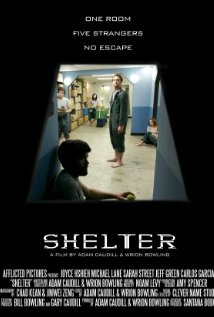 In collaboration with Atlas Cinemas and the Ohio Independent Film Festival, Independent Pictures is screening the independent film, "Shelter," written, produced and directed by Ohioans Adam Caudill and Wrion Bowling. "Shelter" will show at 7:00 PM on Friday, November 16 at the Lakeshore Theatre in Euclid, 22624 Lakeshore Blvd. in beautiful downtown Euclid. Tickets are $9.00 and are available at the door or in advance by visiting www.atlascinemas.net. Shaker Heights filmmaker and Independent Pictures' Board Member Todd Kwait will emcee the screening of the film, which tells the story of five survivors forced to wait out their respective fates in a bomb shelter with no contact to the outside world. Produced on a micro-budget, "Shelter" is an exceptionally-made example of the talent that can come from our fine state. Bob Ignazio of the Cleveland Movie Blog writes, "Despite being a micro budget production, there's no need to grade SHELTER on a curve. The writing and directing team of Adam Caudill and Wrion Bowling have crafted a taut little thriller here that feels like an episode of The Twilight Zone that's been stretched out to feature length without feeling padded." (full review here). The screening of "Shelter" on November 16 is a must-see, one-time engagement. "Shelter is a great example of a Hollywood quality film made entirely by Ohio filmmakers," said Kwait, who premiered his third documentary, "For the Love of the Music: The Club 47 Folk Revival" at the 2012 Boston International Film Festival to critical acclaim. Bernadette Gillota, Artistic Director of Independent Pictures, has been screening films since the organization formed in 1993. Gillota said, "Working with limited resources but with a talented cast, tight script, and qualified crew to create a solid film worthy of theatrical distribution; "Shelter" illustrates what true low-budget independent filmmaking is all about." Independent Pictures, parent organization of the annual Ohio Independent Film Festival (OIFF), screens excellent independent feature length and short films from Cleveland and all over the world. What started in a storefront in Tremont as the Off-Hollywood Flick Fest has grown to the annual OIFF and other film production and training programs such as the Film Production Internship Program, Ohio Independent Screenplay Contest and Script Mill, Director of Photography Workshop and more. The screening of "Shelter" on November 16 marks the start of a year-long 20th anniversary celebration that will include events and special screenings all over the Greater Cleveland area, culminating with the 2013 Ohio Independent Film Festival on November 7-10, 2013. Films that are screened at the annual OIFF are selected entirely from filmmaker submissions. For information on submitting a film, visit www.withoutabox.com (search Ohio Independent Film Festival) or send an email to ohiofilms@yahoo.com. The Ohio Independent Film Festival is partially supported by Cuyahoga Arts and Culture and is a member organization of Community Shares.